Posted August 11, 2014 by Emmet Farrell in News. 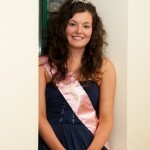 The launch of the 24th Claregalway Agricultural Show took place in the Arches Hotel, Claregalway on Friday August 1st. 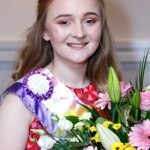 Since 1991 when the first Claregalway Agricultural Show took place, it has gone from strength to strength and at this year’s launch, Chairperson Val Noone said that the constant improvements have made it one of the finest shows in the region. This year’s show promises to be bigger and better than ever before. Prize money has been increased in the Horse and Pony Section as well as a number of indoor classes. Some new classes have been added to the schedule this year also. Entries are already pouring in. Speaking in the Arches Hotel at the launch to sponsors, participants, committee members and friends of the show, Val added that the show has survived through difficult times and quality has always been maintained. He added that it’s vital that people keep supporting the show, which this year takes place in Duffy’s Equestrian Centre, Rockwood, Claregalway on Sunday, August 24th. The Chairperson thanked all sponsors of the show, without whose financial support the show would not exist. He asked everyone to support the sponsors, if at all possible. 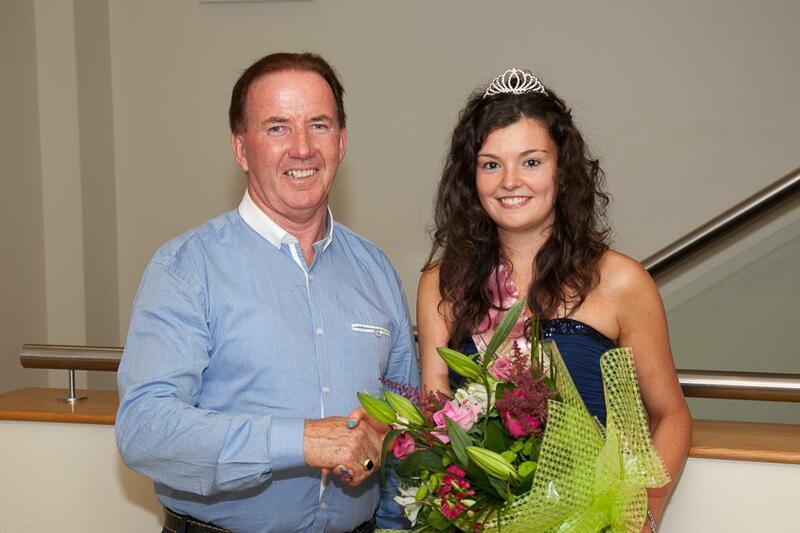 He introduced this year’s Show Queen, Ms Orla McCann and thanked her for taking on the role of Show Queen. 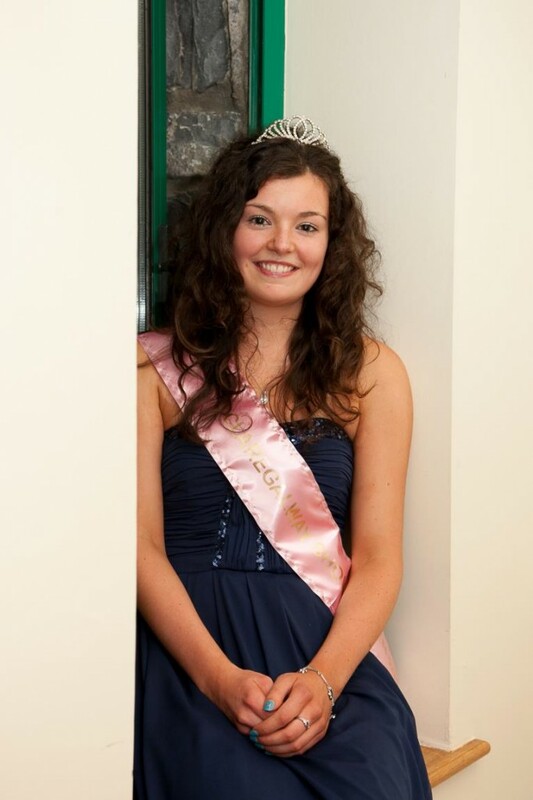 Orla hails from Lakeview, Claregalway. Orla is the daughter of Tom & Myriam McCann who have been associated with the show for many years. Orla pictured with Claregalway Agricultural Show Chairperson Val Noone who presented her with an engraved crystal bowl. She looked resplendent on the night wearing a beautiful navy dress, complemented by silver shoes and accessories, all befitting a queen. 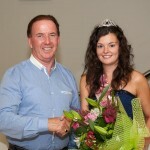 She was presented with flowers and gifts from the show committee together with a sash and tiara. 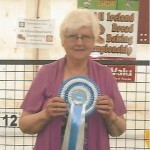 Orla will preside over the presentation of the prizes at the show. Val also thanked Valerie Noone, the outgoing queen and presented her with a bouquet of flowers. 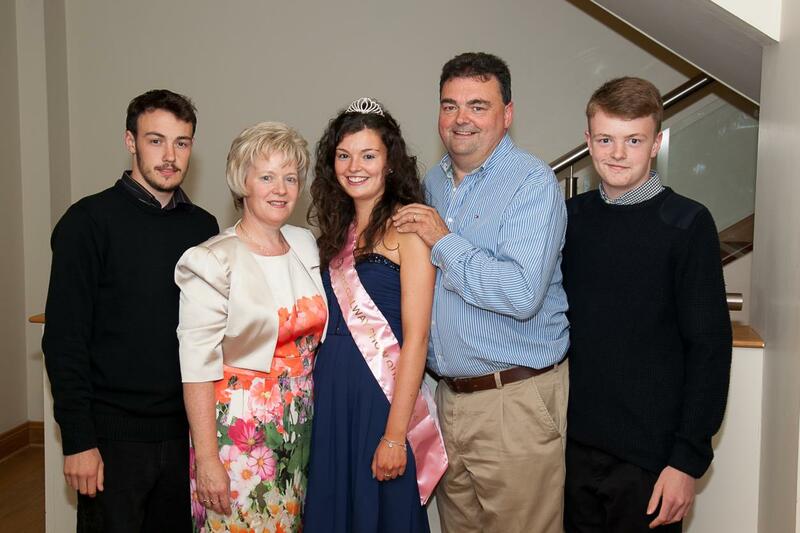 Orla McCann pictured with her parents Tom & Myriam and her brothers Conor & David. Some of the top attractions at this year’s show will include the horse and pony section, cattle and sheep sections, arts and crafts, home baking and farm produce, the ever popular baby show, dog show, poultry and pet show, a dedicated children’s section and not forgetting the numerous trade stands and sideshows. A huge attraction this year will be the Camera Obscura Dome, invented by Noel Arrigan and Gabriel Henry, featuring at the show for the first time ever. This will be enjoyed by children and adults alike. It is an intriguing creation to say the least. It will be worth a visit to the show just to see this in operation. A new addition to the show schedule this year will be the Scarecrow Competition, which is already attracting interest. The Donkey Derby is expected to be as eventful as ever to round off the day. 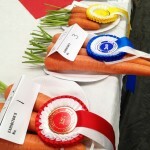 For information please email info@claregalwayagriculturalshow.ie, ring the secretary Carmel at 087 9180723 or the entries secretary Bernie at 091 798931. All information is available on the show’s website www.claregalwayagriculturalshow.ie. Orla McCann, Lakeview, Claregalway who was selected as Claregalway Show Queen 2014 in the Arches Hotel recently. 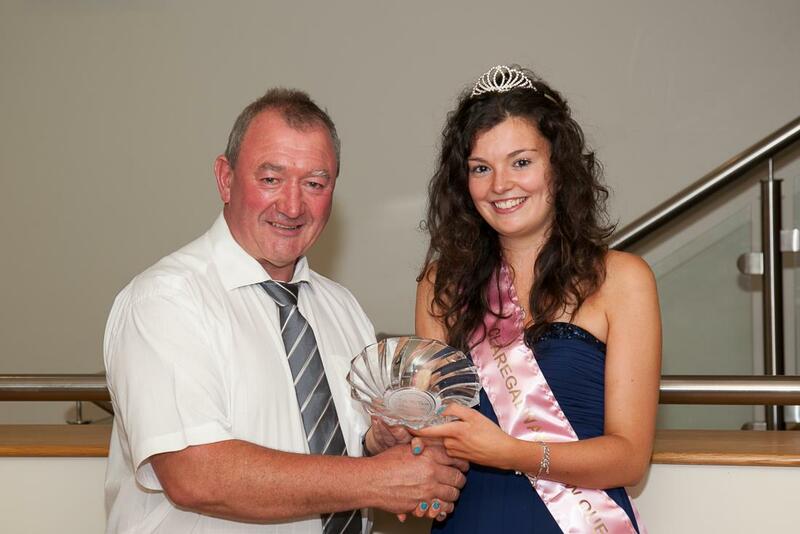 Orla pictured in the Arches Hotel recently being presented with a bouquet of flowers by Kieran Quinn, Vice Chairperson of Claregalway Show. 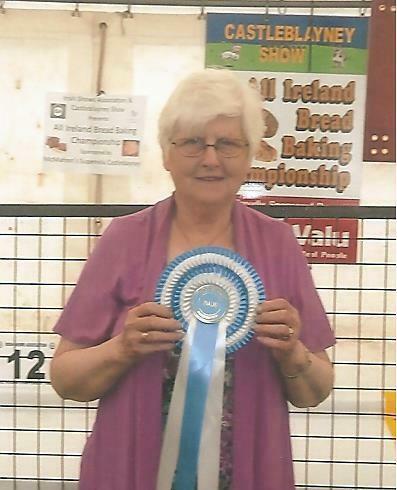 Congratulations also to Bernadette Long, Kiniska, Claregalway, who was a finalist in the SuperValu All Ireland Bread BakingCompetition at Castleblayney Show recently.